NAV, Leather Seats, Back-Up Camera, Rear Air, Dual Zone A/C, WiFi Hotspot, Onboard Communications System, Remote Engine Start, SUNROOF AND SPOILER PACKAGE. IRIDESCENT PEARL TRICOAT exterior and JET BLACK interior, LT trim. SEE MORE! KEY FEATURES INCLUDE Rear Air, Back-Up Camera, Onboard Communications System, Aluminum Wheels, Remote Engine Start, Dual Zone A/C, WiFi Hotspot. Satellite Radio, Remote Trunk Release, Keyless Entry, Child Safety Locks, Steering Wheel Controls. OPTION PACKAGES SUNROOF AND SPOILER PACKAGE includes (C3U) power, tilt-sliding sunroof with additional skylight fixed glass aft of the sliding glass, with power sunshade and (T43) rear spoiler, LT LEATHER PACKAGE includes (AG2) front passenger 8-way power seat adjuster, ENGINE, 3.6L DOHC V6 DI WITH VARIABLE VALVE TIMING (VVT) (305 hp [227.4 kW] @ 6800 rpm, 264 lb-ft of torque [356.4 N-m] @ 5200 rpm) (Includes E85 FlexFuel-capable with (FE9) Federal emissions. When ordering (NE1/YF5) Northeast/California emissions for E85 include (NC7) Federal emissions override for Fleet or Government order types only. ), LT CONVENIENCE PACKAGE includes (KA1) heated driver and front passenger seats, (UVD) heated steering wheel, (DD8) auto-dimming inside rearview mirror, (UG1) Universal Home Remote, (KI6) 120-volt power outlet, (AP9) trunk cargo convenience net, (B58) premium carpeted front and rear floor mats and (B36) carpeted trunk mat, LT ENTERTAINMENT PACKAGE includes (IO6) Chevrolet Infotainment System with Navigation, (UQS) Bose Centerpoint Surround Sound premium 11-speaker system, (TG5) single-slot CD/MP3 player, (KI6) 120-volt power outlet, (C9B) ambient door lighting and (C9J) ambient instrument panel lighting Tax DMV Fees & $597 processing fee are not included in vehicle prices shown and must be paid by the purchaser. Vehicle information is based off standard equipment and may vary from vehicle to vehicle. Call or email for complete vehicle specific informatio Chevrolet Ford Chrysler Dodge Jeep & Ram prices include current factory rebates and incentives some of which may require financing through the manufacturer and/or the customer must own/trade a certain make of vehicle. Residency restrictions apply see dealer for details and restrictions. All pricing and details are believed to be accurate but we do not warrant or guarantee such accuracy. The prices shown above may vary from region to region as will incentives and are subject to change. 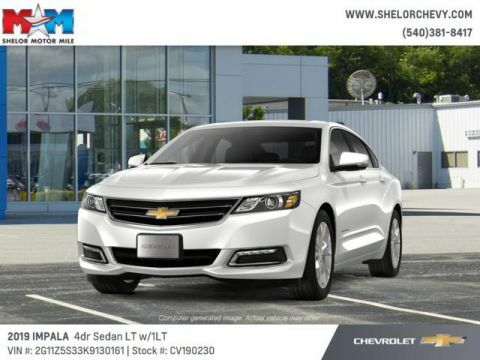 Price includes all applicable rebates, must own a 05’ or newer non GM product, not all buyers will qualify, see a Shelor Chevrolet salesperson for details. Other rebates may be available, see a Shelor Chevrolet salesperson for details. Price does not include tax DMV fees or $597 processing fee.